Pennsylvania held various elections on November 2, 2010. These include elections for a Senate seat, a gubernatorial race, and many state legislature races. Former Republican, now Democratic, Senator Arlen Specter was defeated in a primary election to Joe Sestak, who then faced Republican Pat Toomey. In a narrow race, Pat Toomey was victorious over Sestak. A special election was held on May 18, 2010 to fill the seat left vacant by the death of Democratic U.S. Representative John Murtha. On March 8, 2010, the Pennsylvania Democratic Party's Executive Committee nominated Mark Critz, Murtha's former district director. On March 11, a convention of Republicans from the 12th district nominated businessman Tim Burns. The Democrats held the seat in the special election, with Critz defeating Burns. Both would face each other again in November's general election, with Critz winning again. All 19 seats will face an election. Pennsylvania is expected to lose one congressional seat after the 2010 census. 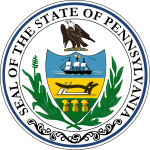 A new governor was elected(incumbent Governor Ed Rendell (D) is term limited), Tom Corbett, the Republican, won the general election with 55% of the vote against the Democrat, Dan Onorato, who carried 45% of the final vote. Pennsylvania holds judicial elections in odd-numbered years. ^ Catanese, David (February 17, 2010). "Murtha special election set". The Politico. Retrieved February 17, 2010. ^ Faher, Mike (March 12, 2010). "GOP chooses Burns for special election in 12th". The Tribune-Democrat. Retrieved March 12, 2010. ^ "Dem Critz holds Murtha's Pa. seat". Politico.com. May 18, 2010. Retrieved July 9, 2010. ^ Associated Press (May 18, 2010). "Critz to face Burns again in November". Tribune-Democrat. Retrieved July 9, 2010. This page was last edited on 26 December 2018, at 18:10 (UTC).